If you have a number of missing and compromised teeth or uncomfortable dentures, the All-on-4 could be the perfect solution. Patients say this treatment is life-changing! All-on-4 replacement teeth are fixed permanently and securely in your mouth, so they function like your normal teeth. Help to maintain your facial structure and can bring major benefits for your oral health. The benefit to you, our patient, is secure and natural-looking teeth, often within just one day of surgery. The treatment method is so clean and efficient, and the healing time is surprisingly quick. Our Master Technician, TJ Nicolas, will personalise your All-on-4 treatment, considering your personal requirements for colour, size and appearance as part of your overall facial structure. 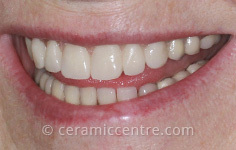 Patients are welcome to bring photos of the appearance they would like to achieve or a look they would like to regain. The whole clinical team here at Implant & Ceramic Dental Studios are pioneers in All-on-4 treatments and inclusive in their advancements over the last 20 years. Their experience and knowledge are outstanding: All-on-4’s have eliminated complicated surgical bone and sinus grafting requirements and is super-effective. Stronger, longer implants can be used in upper arch restoration procedures at the back of the jaw. Your confidence and smile can be enhanced to the best they’ve ever been from something as simple as this. The financial outlay on All-on-4 treatment is much lower in comparison to single and standard implants. To reduce costs even more and for unmissable offers, please see our membership packages. A single implant is a small titanium plug that fits inside the jawbone and replaces the root part of a missing tooth. Minor surgery is required to insert the implants, which will fuse to the living bone. 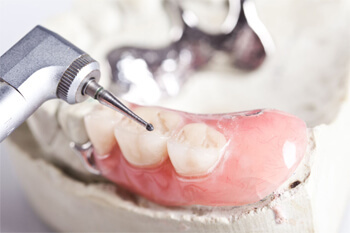 For individual teeth, a single implant is placed and a crown is attached to give you a highly-realistic-looking and functional prosthetic tooth. Gum tissue and the new crown are expertly colour-matched. The All-on-4 is a bridge that matches your gums and holds a full set of crafted crowns. The bridge structure is supported on four implants, which provide a long-lasting foundation for your new teeth. Using the latest available technology for taking your precise measurements are ‘T’ and ‘CT’ scans. These, together with our expert knowledge, will determine the best possible location for the ‘4’ implants. The harmonisation of your jaw and joints will be tested, while remarkably small adjustments can be made to your new teeth for optimum comfort, bite position and smile line. In just one day, any failing teeth will be removed by our specialist dental surgeon. Patient care is our priority, so sedation is an option (although rarely required for implants). Light and full sedation options are available. Four implants are inserted into the jawbone to form a healthy, strong, long-lasting foundation. The initial bridge is custom-built to match and fit into the gum line for bite alignment, function and comfort. Two to three hours later, the bridge is fitted into the gums and the healing process starts. You walk out on the same day with a beautiful, natural, functional smile! This process can be completed in one or both upper and lower gums on the same day. Because the implants fuse with the jawbone, it helps prevent future bone loss in the jaw. 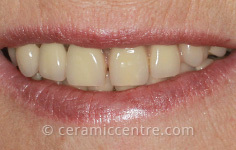 Six months later, a permanent bridge is designed and fitted with any adjustments to create the best possible fit. There are two options: the same-day option, or a delayed treatment option. Follow the link to learn more about exclusive same-day services. Light or heavy sedation is available. The choice is entirely the patient’s. To help calm any nerves, the goal is to hardly know there has been a surgical procedure. What credibility does the Implant & Ceramic Dental Studios have for this treatment? The qualifications and experience accumulated by our clinicians and technician not only date back to when All-on-4ever treatment began, but many UK dentists have used and trained at our facility. We know and use the most innovative systems available and the best is always chosen for the patient. We have a 100% success rate on our All-on-4ever implants. For a full medical, functional and aesthetic goal assessment with our Master Technician, TJ Nicolas, call 01285 821 220.